Elizabeth McGovern not only played the role of the chaperone in this movie but she actually chaperoned this film project to fruition after reading the book by Laura Moriarity showing it to Julian Fellowes and Michael Engler who were the writer and director of Downton Abbey and who then took on these roles with this movie. The story opens in 1922 in Wichita, Kansas, where a talented teenage dancer (Haley Lu Richardson) from a well to do family has the opportunity to go to New York City and study with a prestigious dance school for a few months. 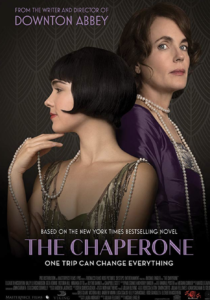 Her family requires that a chaperone should accompany her and a neighbor, Mrs. Norma Carlisle (Elizabeth McGovern), is ready to take a break from her husband and volunteers for the job.